Fine artist John Pearce was my form tutor at Coleridge junior school in Crouch End, north London in the 1980s. He is foremost an incredible painter and draughtsman and his enthusiasm and knowledge of art and science was highly influential on me at school. He always encouraged my own artistic development... and continues to do so today. His depictions of leafy city gardens and local woodlands display a simple edginess and abstraction of design that allow the incredible amount of detail contained in each picture to breath. I recall one day at school being shown a photograph of a painting Blackberries in August (now hanging alongside Millais and Rossetti in London’s Guildhall) and I was mesmerised by the shear realism of the scene. Barely discernible at the back of the garden in the picture was a ball and I remember John telling me that it was a distraction when painting! I first became familiar with this famous French Impressionist when seeing the exhibition 'Monet in the 90s' at the Royal Academy, London in 1990. The show presented his series paintings: works featuring localised landscapes painted at different times of day which captured the subtle nuances of rapid transient light. It included the famous Rouen Cathedral series, grainstacks, poplar trees and waterways in Normandy. The depictions of grainstacks were memorable because they appeared almost like still life compositions that featured strange fairy-cake like objects bathed in exaggerated and highly accentuated colour. I was influenced by Monet's use of laying colours side by side to create an optical mixing effect, something I would later experiment with on my art foundation course. Thiebaud’s depictions of contemporary American consumer objects, painted in the 1960s, such as gumball machines and mass produced foodstuffs have often been associated with the pop art movement, but the resemblance is superficial because he was primarily a painter and draughtsman who really enjoyed the personal feel and texture of paint. He also had a genuine appreciation of art theory, history and trying to solve the problem of image construction. Much of Thiebaud's technical ability was underpinned by his former career as a cartoon animator for Walt Disney, which gave a grounded and disciplined approach to the types of subject that he depicted. 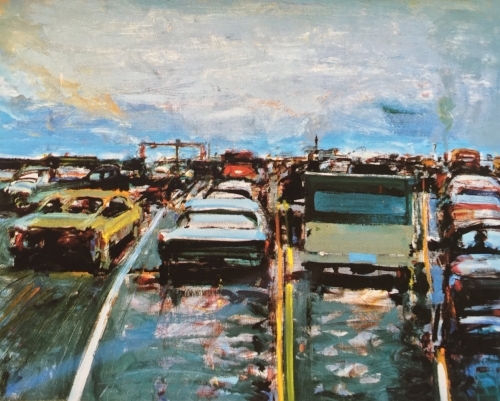 My favourite works of his, however, are the grubby contemporary Californian urban landscapes and simple observational pieces, such as Freeway Traffic, which come across as charming and thought provoking. What I admire about contemporary artist Markey’s work is his highly simplified and fresh approach to observational painting. Using what appears on the surface as a limited colour palette and minimal brush strokes, he conveys the quiddity and mood of mundane places in a candid and realistic fashion. He has a confidence to tackle mundane and off-beat subjects such as aeroplane trails in the sky, suburban housing and retail estates, parking areas overlooking the sea on dreary rainy days etc. Special mention goes to my friend and fellow art school student Andrew who has always had a fabulous natural ability and confidence to create pictures and, like Wayne Thiebaud, has a genuine and informed appreciation for art. Much of his work depicts his Cornish home environment, but the appeal of his pictures goes beyond the commercial nature of the subject matter. The paintings seem to be underpinned by an energetic and cursive line drawing which gives the work a vitality and decisiveness that is not seen in many other contemporary plein-air artists.